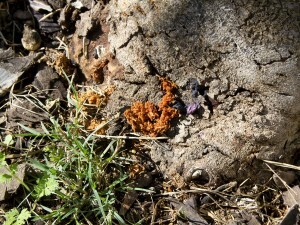 I received a comment on an old post from Charmain from Arborviews on the 19th of April, about the bug on the Fig Tree. 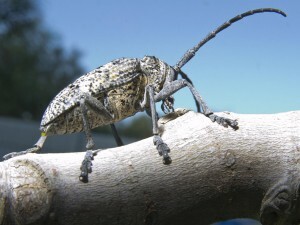 She identifies it as a Phryneta Spinator – Stem Borer Beetle from South Africa. A real pest!! 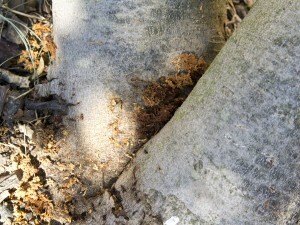 The larva bore into the fig tree and can actually kill it!! 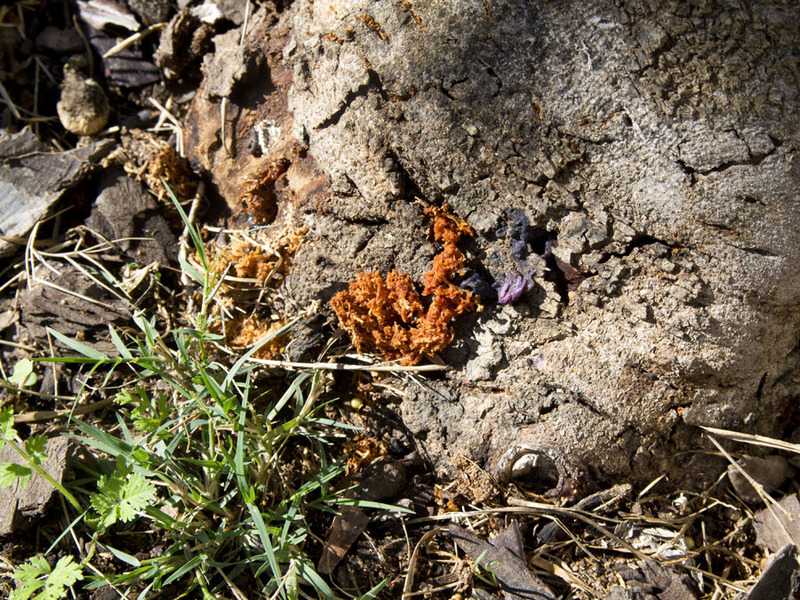 It was uncanny, because that very same day, I was taking photos of my “meadow” for my update and came across weird sawdust pulp at the foot of my Fig Tree. I had not noticed this because of the bark mulch I have around the stem. I was horrified to see what had caused this! 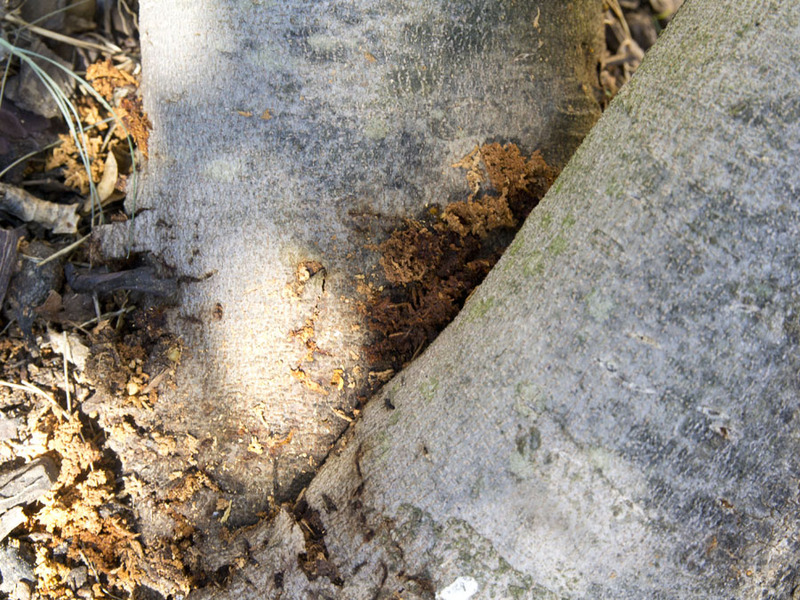 The damage can kill the fig tree! Remember the post I did on these beetles? The first person who commented was Denni, she immediately called it the Phryneta Spinator and warned me about the borer larvae – I should have guessed. Thanks!! This large indigenous beetle of about 35 mm in length has become a serious pest of fig trees in Cape Town. 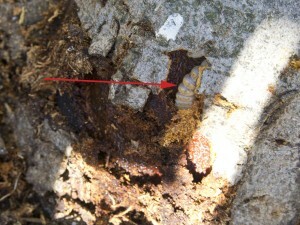 The larvae bore into the wood and in severe cases can eventually kill the tree, particularly if it is old and lacking in vigour. 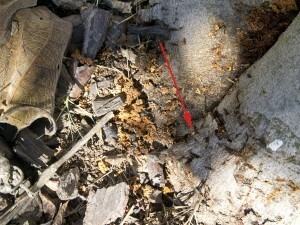 It can also be a pest of Willow trees. The large size, long antennae, mottled appearance and the prominent spines on each side of the thorax make this species easily recognisable. The life cycle takes slightly over three years! Each egg is laid in summer in a T-shaped slit that the female makes near the base of a branch – from mid-November through to mid-March. 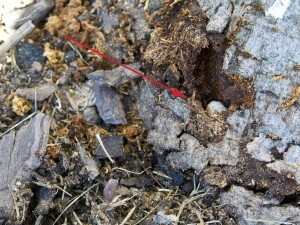 The beetles are not usually nocturnal and egg laying seems to only occur during the day. Eggs take 10-18 days to develop (they don’t say how many). 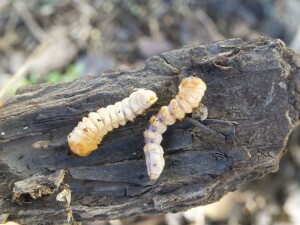 The hatched larva initially feeds on the bark and then later enters the wood and chews its way through the wood, forming tunnels as it does so. This diet of wood is not particularly nutritious and so it needs to eat a lot of wood in order to grow. Larvae are cannabalistic so they tend to space themselves out in the wood, avoiding contact with larvae in other tunnels. 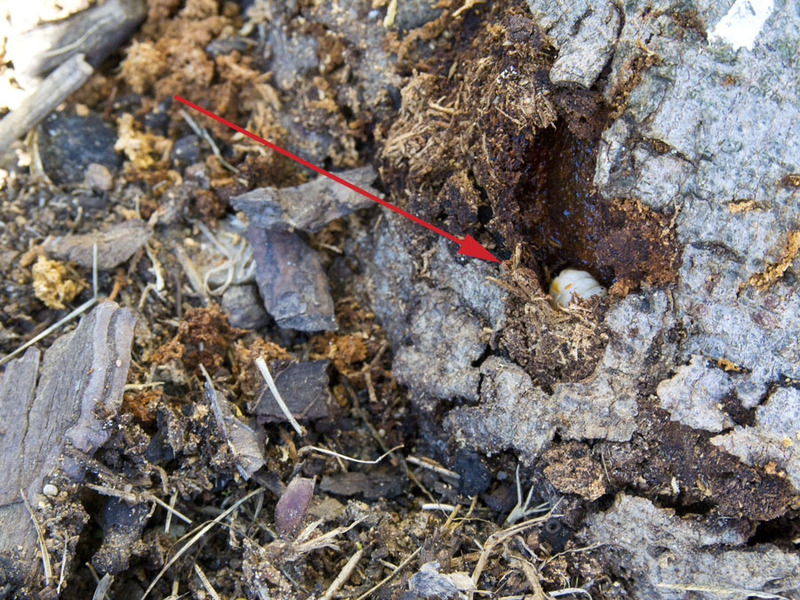 The larva packs excrement (‘frass’) and castings behind it as it burrows and pushes some of them through small holes in the bark so that one can often find small heaps of reddish wood fragments at the base of the tree. Larval development takes from 2.7-2.8 years. 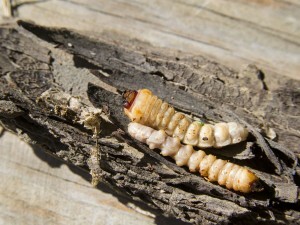 The adult form develops inside the pupa and on maturity emerges. The female then needs to mate with a male and find suitable sites on host plants for laying her eggs. Thank you Charmain – I value your comment and coming back to us on this beetle. Now, I will have to take measures to get these larva out of my favourite fig tree! I have just discovered the larva in my 16 year old fig tree and it seems my tree has been infected for a number of years. I managed to extract 6 of them but the damage to the tree is quite extensive. Not sure whether it will survive but I also understand that one can inject a systemic into the base of the fig tree which should kill off any which remain. It’s a very nasty job digging for them! I’m so glad we don’t have these beasties over here. Nothing seems to harm it here except the cold.What measures did you take to get rid of them? We have a longhorn beetle here that is destroying elms. 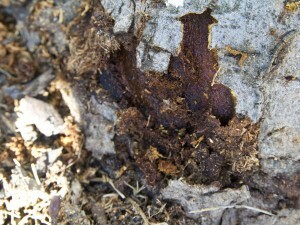 The only way they have found to control it is to destroy infected trees. I hope there is a better solution for your fig. What a tragedy! How do you get rid of the beetle. The Pine beetle here in the U.S. has destroyed whole mountainsides of lodgepole pines. I hope there is a way to combat your beetle. Oh dear! Do you know what to do with this? It is going to be difficult. They usually bore deep into the tree roots and stem and difficult to get out. The suggestion is getting a wire and stick it up the larvae holes. This sounds easier than it seems. I will monitor the “shavings” and see if there are any more in the tree. Thank take action with my wire. 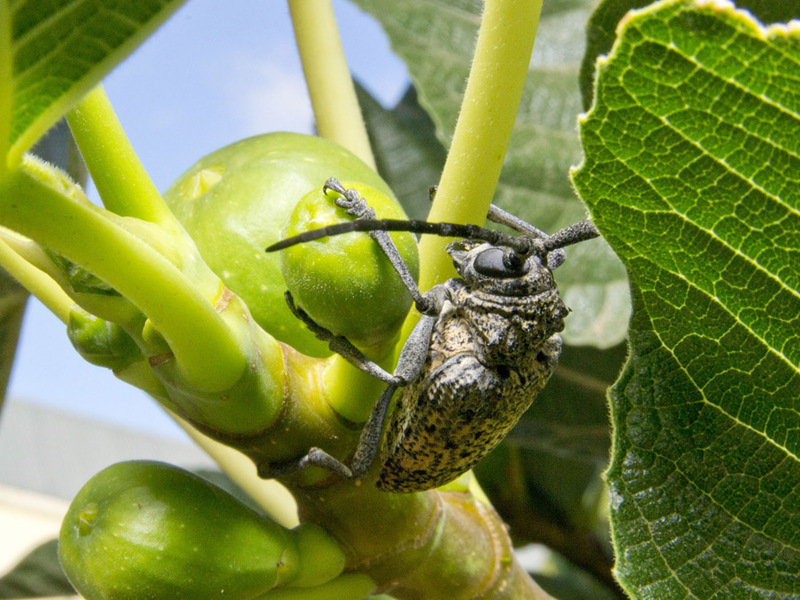 I was too kind leaving them on the Fig Tree, so folks – get them off asap!! Ack! Why are some of the coolest-looking bugs often some of the most troublesome? Good thing you found out about this early! Omg, my sympathy goes out to your fig tree. I don’t know if we have those here, but I’ll be very careful with my figs. Who knew.